Vintage pieces can be intimidating to wear. No one wants to look like a frumpy throwback, do they? The simplest way to keep vintage pieces looking fresh is to style them with modern pieces. Adding chunky (and fun) jewellery gives a modern feel. Tough boots also stop any vintage piece looking twee. These DM's are my (current) favourite boots. 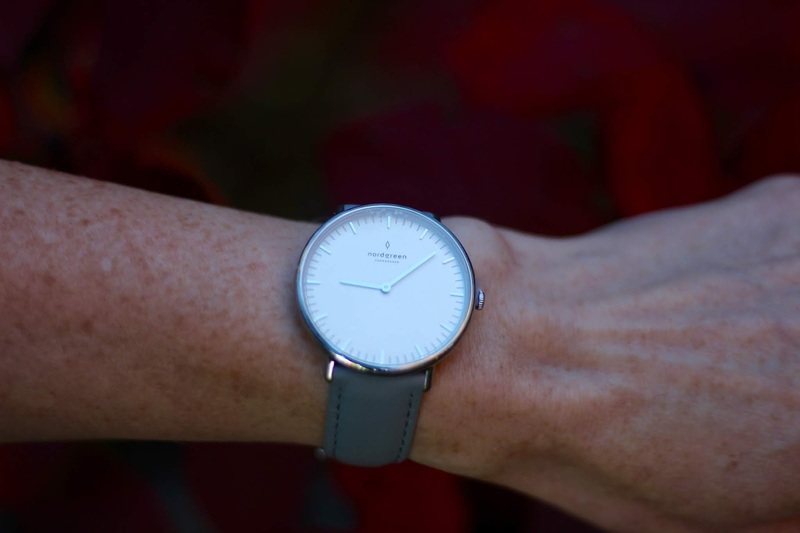 I'm also loving this minimalistic watch that was kindly sent to me by Nordgreen. All of their watches have a classic look and the company has a great "giving back programme" that you can read more about HERE. I love the oversized look on my narrow wrists. If you like the look of a classic watch, or you are looking for a great Christmas gift, this watch would be a beautiful choice. You can also get a free extra strap (using the code AUTUMN18) to help you change up your look and get more mileage out of the way the watch looks. What colours would you go for? I love the simplicity of this outfit and the fact it still has enough impact, despite being black, grey and white... which could easily be a bit boring, couldn't it? I'd love to know how YOU would have styled this vintage skirt! SKIRT: Vintage ... try this... or this! Vintage items always give so much to an outfit. That skirt is absolutely gorgeous. Loving your hair today too, I'm toying with going short and you may have provided me with the inspiration I need!! I love how you've accessorized it, so brilliant!, accessories enhance this monochromatic outfit to the top!, and the vintage skirt is so cute!. 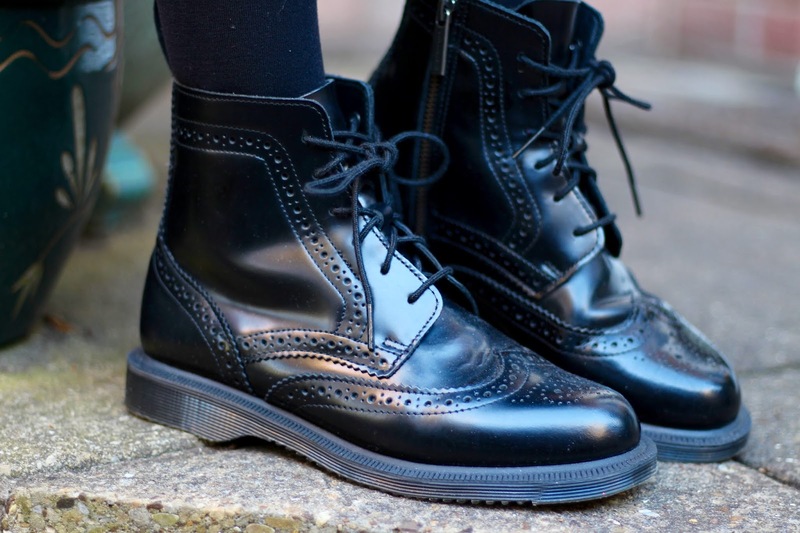 Obviously I'm in love with these DM boots, they're classic, chunky, cool! Thinking seriously on buying a pair, even if I Don't Need a new pair of boots! 'Need' doesn't come into the equation when talking about new DM's! Oh gosh I just love love LOVE the skirt! I think you've styled it perfectly, the top and boots complement it extremely well and "rugged" up the frilly skirt! I'm conscious about my tummy (yours is a lot flatter, believe me) so I won't be able to style it exactly the way you did. I would've worn the skirt with a baggy sweater but my oh my I wish I have those biker boots. I could see you in these boots Liyana! I am in love with the necklace! But the outfit....I would love to wear it myself! I like the contrast of the very femme skirt with the masculine-looking Docs (I'm a fan of those ones!). I would probably have done a bright colour with the vintage skirt, but I love it with the grey as a nice change-up. I'm not a fan of turtlenecks, but I have a few. Lovely outfit, Samantha! I'm in the teeny-tiny wrist demographic too. Hahahaha.... I'm glad you've got teeny tiny wrists too Sheila! My youngest had bigger wrists when she was 8. Mine cause plenty of giggles at home! I love everything here Sam, the styling is fabulous. I always freak out over that magpie necklace. I adore it with the skirt, he looks like he just flew out of the skirt foliage! I think the boots are the icing on the cake, they contrast so perfectly with the skirt. Brava ma bella! Thank you so much Lisa and thank you for popping over!! I've always loved roll neck sweaters and have worn them throughout my life during the fall and winter months. They've made such a huge comeback! Your outfit is easy and classic Sam . The skirt appears to be a vintage beauty!! They're great aren't they Judy? I wouldn't be without mine! 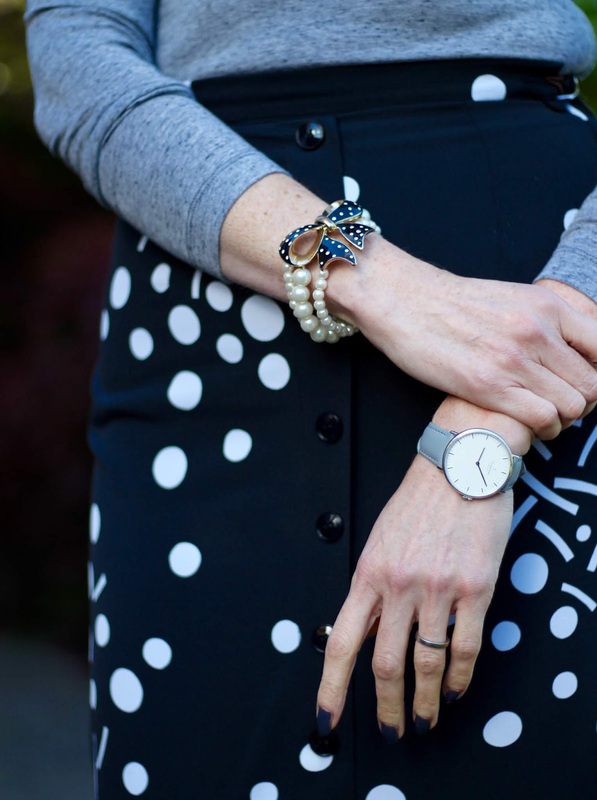 I'm a fan of anything vintage and this skirt is no exception.